There are many circumstances that you might need to know how to deep clean a couch. If you are a fan of thrift shops and garage sales, any upholstered furniture you buy should be sanitized and cleaned before you bring it inside. Otherwise, you could inadvertently bring unwanted germs, smells, and pests into your home. Also, if you have children or pets, you know all too well how quickly a sofa can go from looking brand new to looking like it needs to be sent to the curb. Kids and furry friends are pros at spreading germs, crumbs, and stains. If you are looking for the best way to clean a couch that your little ones use often, try a natural fabric couch cleaner first. These are effective ways for sanitizing and removing odors from a used couch without store-bought cleaners. In some instances, you may need to resort to a stronger cleaner and carpet extractor if the stains you're working with are stubborn. *You may want to make a natural upholstery cleaner for spot removal. You can also use a store-bought cleaner. Just make sure to test a small patch of fabric first. The first step is to vacuum up all the loose crumbs, dirt, and fur from the upholstery. Keep an eye out for bug droppings or other signs of pests. You'll want to get the vacuum into every cranny possible and might need to go over the couch multiple times. Next, wipe down any non-upholstery sections with a reliable disinfectant. Make sure the wipes or spray you choose doesn't have bleach as an ingredient because this can damage the wood or other non-fabric parts of your sofa. Test a small spot first if you're unsure. Don't worry about disinfecting the fabric at this point. The cleaning process will do that. If you got the couch second-hand, you might consider spraying the surface down with bug spray before you bring the piece into your home. Bugs and unwanted pests can make a home in old couches and furniture without being seen by the naked eye. Spray the nooks and crannies with an all-purpose bug spray that will work to repel and kill pests like bed bugs, fleas, ticks, and mites. Leave the couch in a well-ventilated area outside your home for 24 hours. Note: If you have pets, make sure the bug spray is pet-friendly. Many odors in couches are caused by bacteria and excessive moisture. Baking soda is an ingredient that will work to combat both issues. 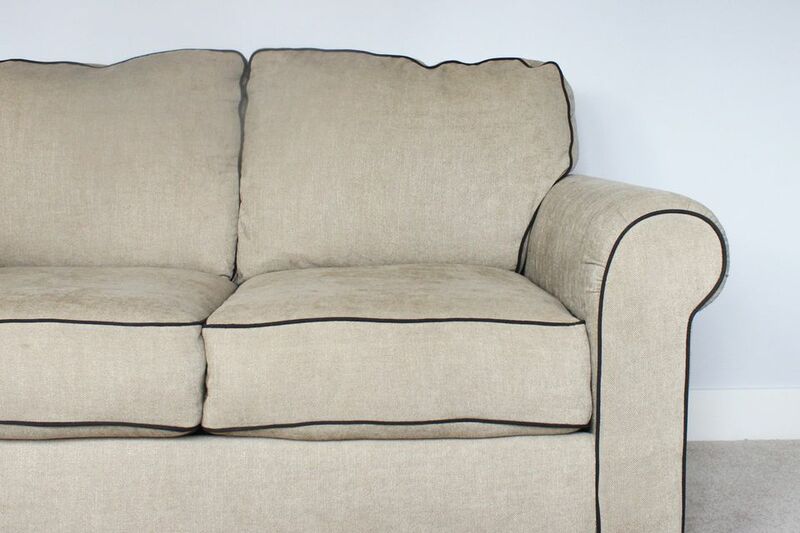 First, make sure you test a small piece of upholstery to make sure the baking soda won't lighten the fabric. Next, sprinkle a generous amount of baking soda on all sections of a couch. Use a bristle brush to spread out the baking soda in an even layer on every upholstered surface. Let the baking soda sit for a few hours without being disturbed, then vacuum it up. If your couch still smells after the baking soda bath, spray down the surface with a mixture of white vinegar and water. Once the solution dries, the vinegar smell will dissipate and so should any other scent. Before you attempt any stain removing on your couch, figure out the type of fabric. Some sofas are made with upholstery that is so fragile that it shouldn't get wet. Others may need special consideration as well, like leather or synthetic upholstery. Find the tag for more insight. Most fabric upholstery should do fine with the following cleaning mixture. Vinegar and Soap Solution: Mix 1 cup warm water, 1/4 cup of white vinegar, and a tablespoon of Castile soap. If you don't have Castile soap, you can use a mild dish detergent. Put the mixture inside a spray bottle or a bowl. Spray or brush on the solution to any stained areas. Use a soft bristled brush or cloth to work the solution in and then blot the stain with a clean, dampened cloth. Try not to oversaturate the area. Crayon: If your item has any crayon stains on it, you can take a rag and rub some WD40 on the stain. Ink: For ink stains, try using rubbing alcohol on a cotton ball and gently rub on the area. Rust: A solution of lemon juice and salt, mild dish soap, and ammonia can help you remove rust stains from furniture.